SAREPTASSIST™: SUPPORT, BY YOUR PATIENTS’ SIDE™. 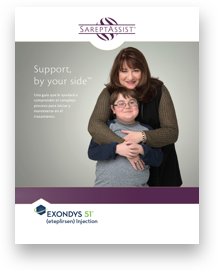 Sarepta Therapeutics is committed to helping patients and families impacted by Duchenne muscular dystrophy through SareptAssist, our patient support program. Our dedicated team is experienced in rare diseases, including knowledge of insurance plans and healthcare networks. They’ll facilitate the paperwork involved in starting and staying on EXONDYS 51 therapy—to help you help your patients. PERSONALIZED SUPPORT FOR YOUR PATIENTS. A TEAM TO HELP THROUGHOUT THE JOURNEY. When your office contacts SareptAssist to enroll a patient, a Case Manager will be assigned to provide one-on-one, personalized support as they navigate the steps to starting therapy. SareptAssist Case Managers have experience in rare diseases (including knowledge of insurance plans and healthcare networks) and are available for your patients Monday – Friday 8:30am – 6:30pm ET. SUPPORT FOR THE PRESCRIPTION FULFILLMENT PROCESS. The Case Manager contacts the insurance company to determine your patient’s coverage and can provide information on any specific authorization requirements and/or financial assistance options. You may be required to write a letter of medical necessity and/or a personal appeal letter on behalf of your patient. Once insurance benefits have been confirmed, the Case Manager identifies and contacts specialty or hospital pharmacies to facilitate access to therapy. The Case Manager contacts your patient and coordinates drug delivery to the appropriate site of care (e.g., hospital, infusion center, or patient’s home). The Case Manager contacts your patient to arrange for the first shipment of EXONDYS 51 from the specialty pharmacy. 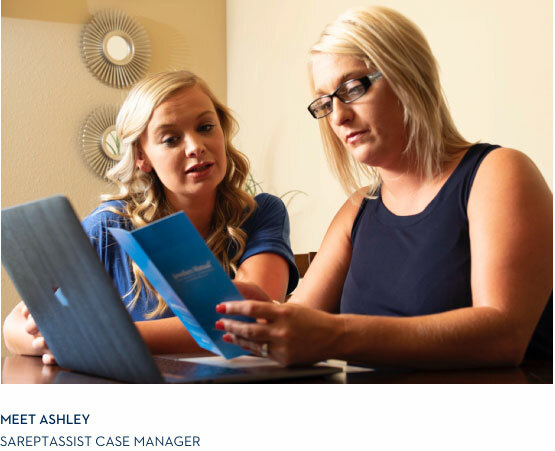 The Case Manager coordinates details with your office, infusion center, or home nurse for your patient’s first infusion. Your patient’s SareptAssist Case Manager can provide information about programs (Sarepta-managed and independent third-party programs) that may offer financial assistance options to eligible insured and uninsured patients. SAREPTA PATIENT CO-PAY ASSISTANCE PROGRAM. The Co-Pay Assistance Program was created for eligible individuals with commercial health insurance in the United States who are prescribed EXONDYS 51 therapy. This program may help with some out-of-pocket costs related to receiving therapy, such as co-pays, co-insurance, and deductibles. If your patient is eligible, their Case Manager will guide them through the consent and enrollment process for the Co-Pay Assistance Program. SAREPTA PATIENT ASSISTANCE PROGRAM (PAP). The Patient Assistance Program can help patients, who are uninsured or rendered uninsured and meet certain eligibility requirements, obtain access to the drug. They may be responsible for additional costs associated with administration of the drug. A SareptAssist Case Manager can provide information on eligibility as well as help facilitate program enrollment. This foundation connects patients with independent charitable organizations that may offer financial assistance. An overview of SareptAssist, our patient support program, covering topics such as insurance benefits, treatment logistics, and infusion options. 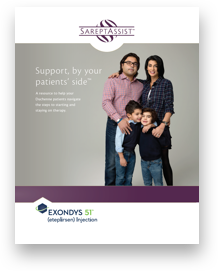 This brochure will help English-speaking patients and families learn about the personalized support provided by SareptAssist dedicated Case Managers. This brochure will help Spanish-speaking patients and families learn about the personalized support provided by SareptAssist dedicated Case Managers. SareptAssist Case Managers are available Monday through Friday, 8:30am – 6:30pm ET. SareptAssist is a resource available only to those who have been prescribed EXONDYS 51 (eteplirsen). SareptAssist is available only in the U.S.
GET YOUR PATIENT STARTED IN JUST 3 EASY STEPS.